The Steam Pump Tea Room, managed by Clare Phillips, is situated in the former 1930's machine shop. The Tea Room is within beautiful grounds and is a lovely place to relax during or after visiting the Museum. A comprehensive menu is available on non event days ranging from all day breakfasts, hot meals and specials at lunch time cooked to order by our chefs, supplemented by a range of hot and cold sandwiches or baguettes, until 2pm. Afternoon teas offer a chance to indulge in a wonderful selection of home made cakes and pastries, the motto being "Probably the best cakes in town". The usual selection of hot and cold drinks, Barista coffees, smoothies and milk shakes are also on offer. A typical menu can be found here. 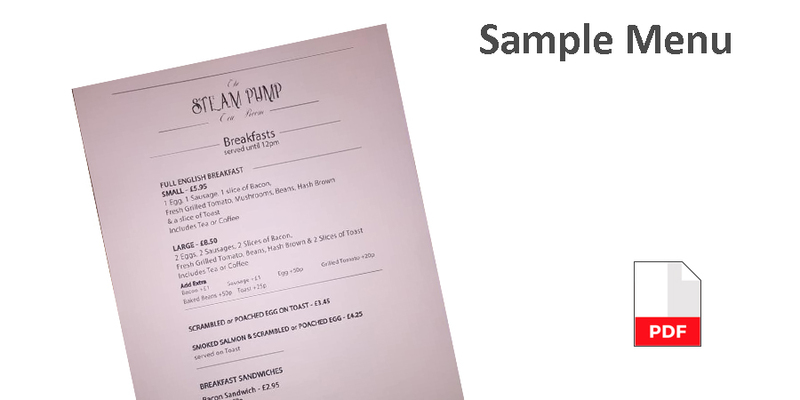 A children's menu is also available. On Special days a reduced menu including hot breakfast rolls and baguettes with cold options are available. Hot teas and coffees or canned drinks are also on sale. Our pavillion on the event field is used to supplement the Tea Room on event days. Entry to the Tea Room and museum grounds is free on non event days, as part of a cycle ride, ramble or just to enjoy a nice cup of tea or coffee.